Summer means heat indexes of 105 degrees Fahrenheit and heat-related illnesses. Heat is the deadliest weather event – killing an average of 658 people in the United States every year, according the U.S. Centers for Disease Control and Prevention. Heat-related illnesses occur when the body cannot keep itself cool. To cool ourselves down, our body sweats. However, when it’s too hot outside and our body temperature rises too rapidly, sweating doesn’t happen quickly enough. By preventing the body from releasing heat, one is at stake of suffering from a heat-related illness. There are three types of heat-related illnesses: heat cramps, heat exhaustion and heat stroke. Heat cramps are muscle pains or spasms – usually in the abdomen, legs or arms – that occur in association with strenuous activity. People who sweat a lot are more prone to heat cramps because it depletes the body’s salt and moisture. Heat cramps also may be a symptom of heat exhaustion. Heat exhaustion is a milder form of heat-related illness that can develop after several hours of exposure to high temperatures without drinking enough fluids. Heat stroke is the most serious heat-related illness. It occurs when the body becomes unable to control its temperature – the body’s temperature rises rapidly, the sweating mechanism fails and the body is unable to cool down. Heat stroke can cause death or permanent disability if emergency treatment is not provided. The skin may be cool and moist. The pulse rate will be fast and weak, and breathing will be fast and shallow. If you or someone you know experiences any of the heat illness warning signs, here are next steps for getting relief. Seek medical attention for heat cramps if they do not subside in one hour. Seek medical attention if symptoms worsen or last longer than one hour. Getting him or her to a shady area. Cooling him or her rapidly, using whatever methods you can. Such as, immersing the person in a tub of cool water; placeing the person in a cool shower; spraying the person with cool water from a garden hose; sponging the person with cool water; or if the humidity is low, wraping the victim in a cool, wet sheet and fan him or her vigorously. Get medical assistance as soon as possible. If emergency medical personnel are delayed, call the hospital emergency room for further instructions. Fortunately, heat illnesses are preventable! Below are a few tips on how to prevent heat-related illnesses. 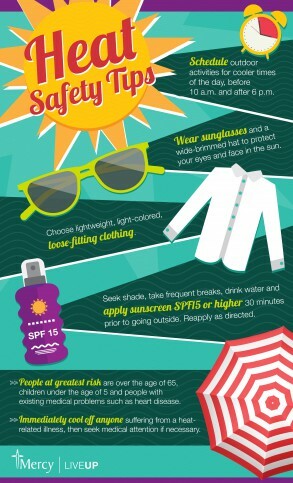 All in all, enjoy the summer but make sure you’re being safe and smart out there!